If you’ve downloaded the free trials of any of our Quiz Publishing Software, you’re probably used to the idea of creating a quiz, creating five or so questions, publishing that quiz, and actually being able to use or distribute it. 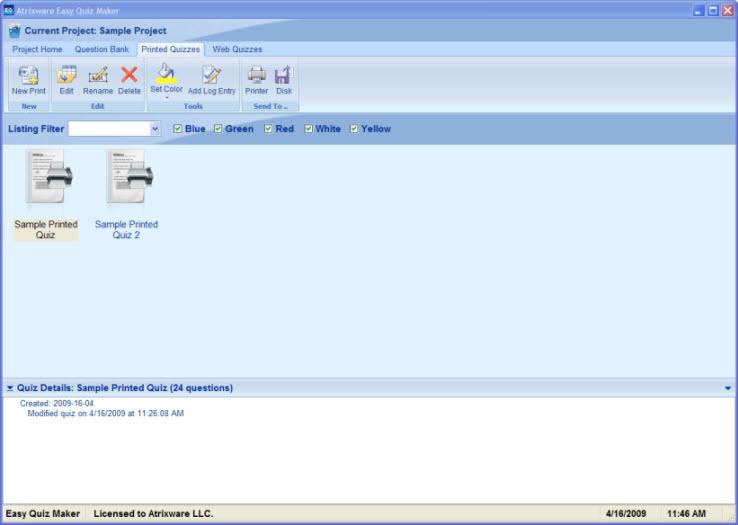 A common question that comes up regarding our PowerPoint Quiz Maker 2009 free trial is if you can insert the question slides you have created into Microsoft PowerPoint. For example, if you download the trial our Easy Quiz Maker software you have the ability to create quizzes, add up to five questions to those quizzes, publish the quizzes, and even customize and link the results into the free trial of our Quiz Management Service. 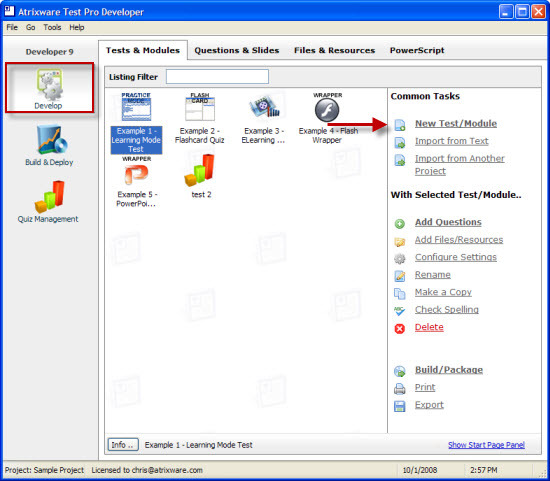 The same goes for Online Quiz Maker, Flash Quiz Maker, and Test Pro Developer. A common question regarding the PowerPoint Quiz Maker 2009 free trial is how to actually insert the question slides you’ve created into your Microsoft PowerPoint presentation. The PowerPoint Quiz Maker 2009 free trial works a bit differently from what you might be used to. The PowerPoint Quiz Maker 2009 free trial will allow you to get a feel of how to create a question slide, an incorrect answer slide, and a correct answer slide. 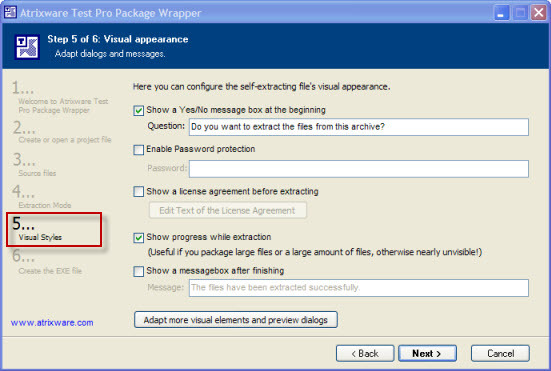 It will also allow you to configure the visual settings, including font style, font size, font color, and the use of the special effects used in Microsoft PowerPoint. However, unlike some of our software, the PowerPoint Quiz Maker 2009 free trial does not allow you to add any questions to the Question Bank, nor does it allow you to publish any of your question slides into Microsoft PowerPoint. To see what a PowerPoint presentation would like using question slides created in PowerPoint Quiz Maker 2009, you can browse to the product page at http://www.atrixware.com/site/subsites/product/pages/powerpoint_quiz_maker.php to see a demo of what slides created with PowerPoint Quiz Maker 2009 look like in action. 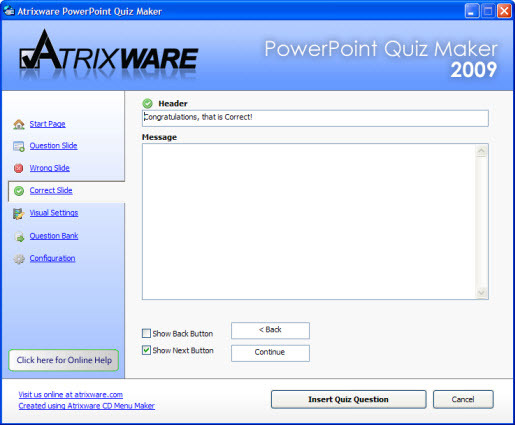 PowerPoint Quiz Maker 2009 is a light-weight, easy to use application for inserting quiz slides directly into your Microsoft PowerPoint presentations. 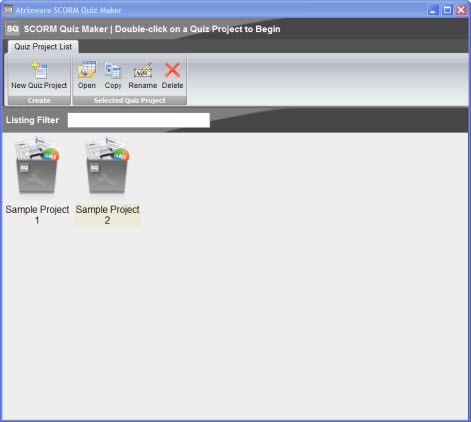 In this tutorial, I am going to show you how to get started using PowerPoint Quiz Maker 2009, specifically how to create your first question slides and insert them into your presentation. When you first run PowerPoint Quiz Maker 2009, I’m presented with a Start Page that allows me to jump right into creating slides. However, before I create my slides I need to make sure I have Microsoft PowerPoint running, the presentation I would like insert quiz questions to opened, and the slide where I would like to insert my questions selected. 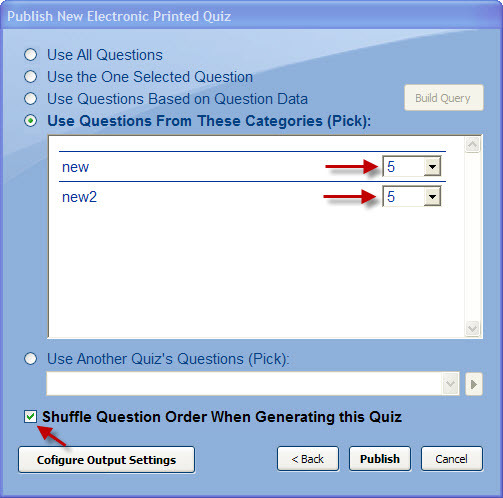 Every time you create a question slide using PowerPoint Quiz Maker 2009, you are actually creating three slides at once – the question slide, the slide displayed if the student answers incorrectly, and the slide displayed if the student answers correctly. So if I have my PowerPoint presentation opened up and have the tenth slide selected, when I insert the quiz question I’m going to create into my presentation, the question will be inserted into the eleventh, twelth, and thirteenth slides, moving the rest of my slides down three spaces. From the Start Page, I can begin creating my question by clicking either the Create a NEW Question link in the Welcome area, or by selecting the Question Slide tab from the sidebar. The Question Slide screen is where you create the quiz the question you want to insert into your presentation. The first thing I need to enter when creating my question is the Header. This will be displayed across the top of my question slide – it could be the quiz name, the category the question falls into, the title of my presentation, etc. If I wanted to insert an image into my question slide, I can check the Allocate Space for an Image box. This will leave spacing in the layout of my slide for me to insert an image once I get back into PowerPoint – I cannot insert the image through PowerPoint Quiz Maker 2009, only reserve the space for it. In the Question field I want to enter the question itself, and in the Choices fields I want to enter the multiple choice answers I would like to present my student with. Depending on whether or not I check the Prefix Choices with a Letter box, my answers can appear as Answer or A. Answer. If I would like to show navigation buttons on my slide (Next or Back), I can check either the Show Back Button box or Show Next Button box, or both. When using the next and back buttons, it is important to denote whether or not this question is preceded by another question. If there is a question before this one and I do not check the Another Question comes before this one box, I will be taken to the slide directly behind this one, which would be the correct answer slide. By checking this option, the back button will skip back the correct amount of slides to display the question that precedes this one. After I’ve finished setting up the Question slide tab, I’m going to move on to the Wrong Slide tab. This is the slide that is displayed to the student if they answer the question incorrectly. Again I’m asked to enter a Header, which in this case could be a message telling them they got the answer incorrect. I can also use the Message field to display an explanation to the student or inform them what material to reference for more information about my question. Enabling the Show Back Button in this case would present the student with a button to try and answer the question again, while enabling the Show Next Button displays a continue button that will take them to either the next question or next slide. The Correct Slide tab works almost identically to the Wrong Slide tab. From here I can enter a Header, congratulating the student for answering correctly. I can also display a Message that might explain the question in more detail. Enabling the Show Back Button box will display a back button to my student that will take them back to the question and enabling the Show Next Button box will show a continue button that takes the student to either the next question or slide, depending on whether or not I decide to insert more questions after this one. Once I’ve finished setting up the Question Slide, Wrong Slide, and Correct Slide, all I need to is click the Insert Quiz Question button at the bottom of the software to have it automatically insert all three slides I have set up directly into my PowerPoint presentation. The Quiz Management Service gives you the ability to enable back end storing and reporting on both your published quizzes and the students who have completed them. Looking at the Home screen at-a-glace, you can see the total number of quizzes you have published (that have been completed by a student – quizzes will not appear in the Quiz Management Service until a student has completed the quiz and submitted their results), the total number of students who have completed a quiz, the quiz with the highest pass/fail ratio, and the quiz with the lowest pass/fail ratio. You can also go directly to the quiz details for your most recently submitted quiz and in the near future you will be able to create certificates and email them to passing students. 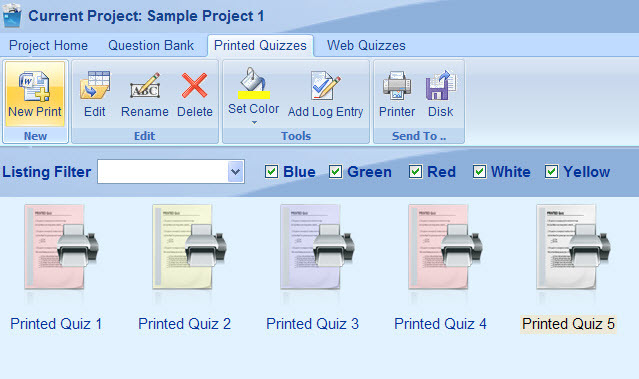 From the View Reports screen, you’ll see a complete listing of all of your published quizzes that have been completed. Right away you can view the number of students who have completed each of your quizzes and the percentage of those students who passed the quiz. Using the Search feature you can easily find a quiz by the title you gave it. Using the Print View or Export to Excel options, you can easily transfer your reports to printer-friendly view or Microsoft Excel. 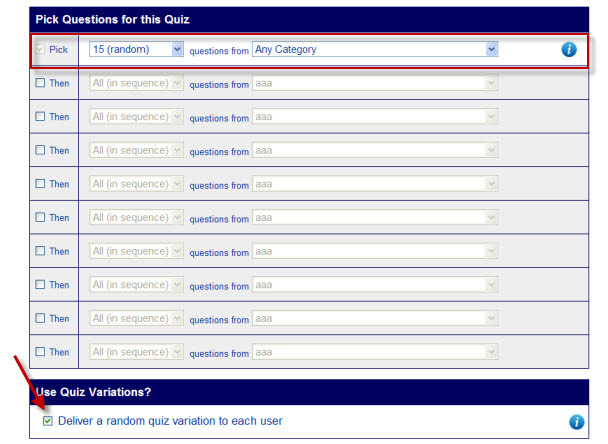 By click on either the title of your quiz or the Details button, you can view even more information about your quiz. At the top of the Quiz Details page you’ll see some basic quiz information, such as the quiz title, total times completed, the passing score, and the percentage of students who passed your quiz. Below that you’ll see a complete listing of all the students who have completed that quiz, with the date they completed it and what they scored (For quick viewing, students who passed have a blue bar graph while students who failed have a red one). Using the View All, View Passed, and View Failed buttons, you can narrow down your results to just look at the students you want to focus on. As with all our reports, you can Search, Print, or Export to Excel your student data using the top buttons in the Quiz Management Service toolbar. Looking at the View Students screen, you’ll see a listing of all of the students who have completed one of your quizzes. From the View Students listing, you can easily see the students name and email, the total number of quizzes they’ve completed, there average for all the quizzes they have completed, and the first time they completed one of your published quizzes. You can easily email a student by click the Email button, which will bring up your default email editor with the student’s address ready for you. If you click on either a student’s name, email address, or the Details button you’ll be taken to the Student Details screen. Here you can edit the student’s name or email address, see when they first completed on your quizzes, see the total number of quizzes they’ve completed, and see their average for those quizzes. Your also presented with a listing of all the quizzes they completed along with the date they completed it and their score for that quiz (as with the Quiz Details screen, passing scores are represented with a blue bar graph, failing scores with a red one). Just like in the Quiz Details screen, you can narrow your view of the quizzes by using the View All, View Passed, and View Failed buttons. You can also sort the quiz listing by the quiz title, completion date, or student’s score by clicking on the respective column heading. By clicking of the Details button in either the Student Details screen or the Quiz Details screen, you’ll be presented with a detailed report for a individual student’s results for a quiz. 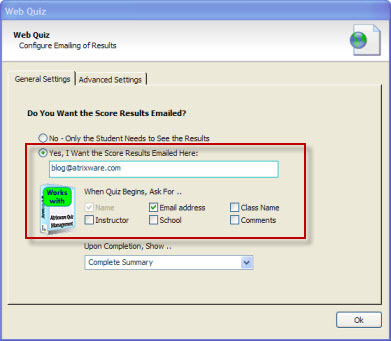 In the top portion of the View Detailed Quiz Report screen you are presented with the students name, email address, the IP address of the computer they completed your quiz from, the completion date, the quizzes passing score, and the students score (Again, blue is passing, red is failing). In the second portion of the View Detailed Quiz Report screen you are shown the complete results for that quiz, the results themselves being determined by how you configured your email reports from the quiz authoring tool you used to create your quiz. 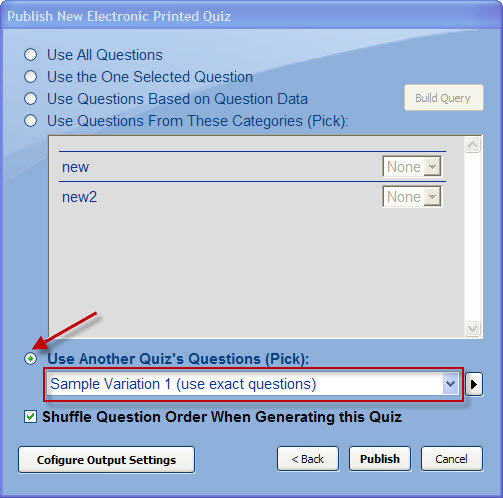 For more information of how to create quizzes and set up reports that are compatible with the Quiz Management Service, you can view the series of articles also found on this blog regarding how to use each of our compatible quiz authoring tools with the Quiz Management Service. Once you created an online quiz using either Easy Quiz Maker, Online Quiz Maker, or Flash Quiz Maker, you’ll need to upload the files created to your webserver in order for your students to access your published quiz. 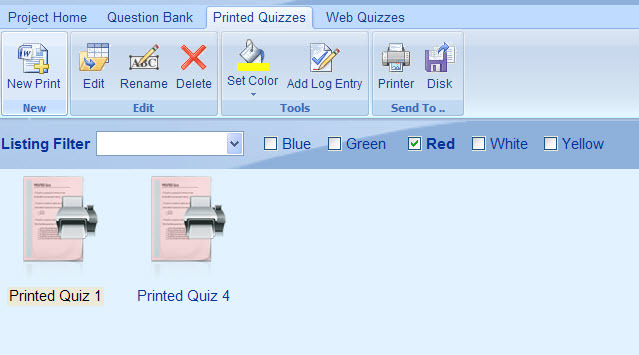 Select the Published Quizzes tab and then click on the Web Quizzes tab at the top of the screen. With the quiz you would like to upload to your web server highlighted, click on Copy to Disk in the Task Panel. 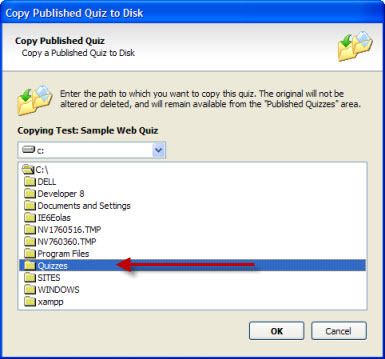 This will bring up the Copy Published Quiz to Disk window, allowing you to select where you would like to copy the files on your hard drive. 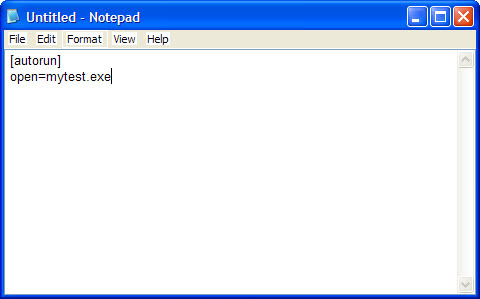 I’m going to use an easy to remember location; C:\Quizzes so I can find the files easily using Windows Explorer. 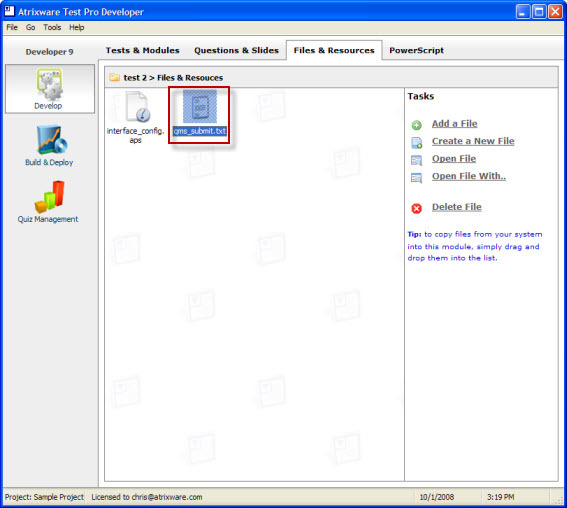 Browse to the folder where you copied the published Quiz files using Windows Explorer. 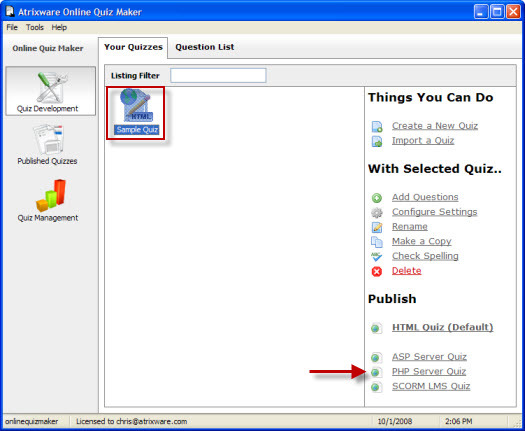 Select the Published Quizzes tab and then click on the HTML Quizzes tab at the top of the screen. With the quiz you would like to upload to your web server highlighted, click on Copy to Disk in the Task Panel. Select the Published Quizzes tab and then, with the Quiz you would like to upload to the web highlighted, click the View Files to Distribute link in the Task Panel. 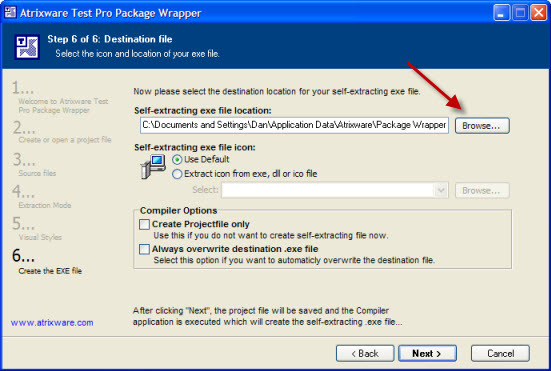 This will open a Windows Explorer window with the files you need to upload to your web server. 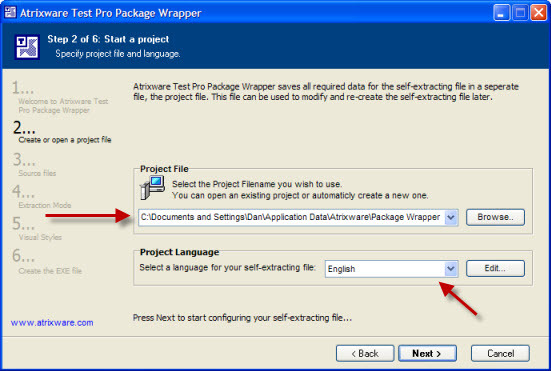 Once you have a Windows Explorer window open showing the files from your published quiz, you can upload the files to your web server using FTP. To do this, open another Windows Explorer window and in the address bar type in ftp://yoursite.com (yoursite.com being the URL to your FTP server). After you hit the enter key, you should be prompted to enter your username and password (these would be provided to you by your web host). 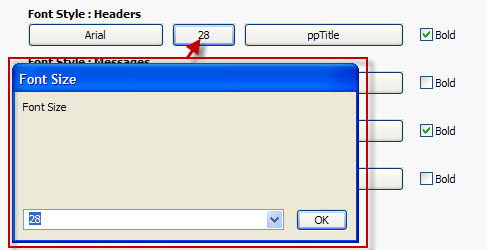 Once you’ve entered your username and password and have logged into the FTP server, you should see a listing of files or folders. 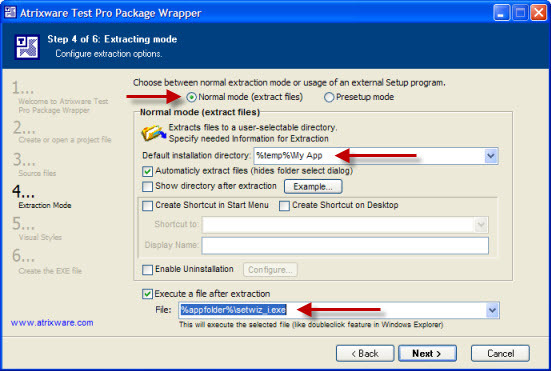 Right click in the explorer window and select New > Folder from the menu and enter a new name for the subfolder you would like to upload your files into (you could upload your files into the root directory, but it is not recommended). 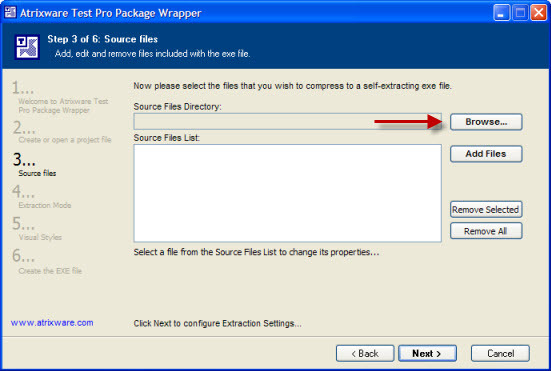 Double click on the folder you just created to open it up and simply drag the published quiz files from the Windows Explorer window of your hard drive over to the the new folder you’ve created on your FTP server. 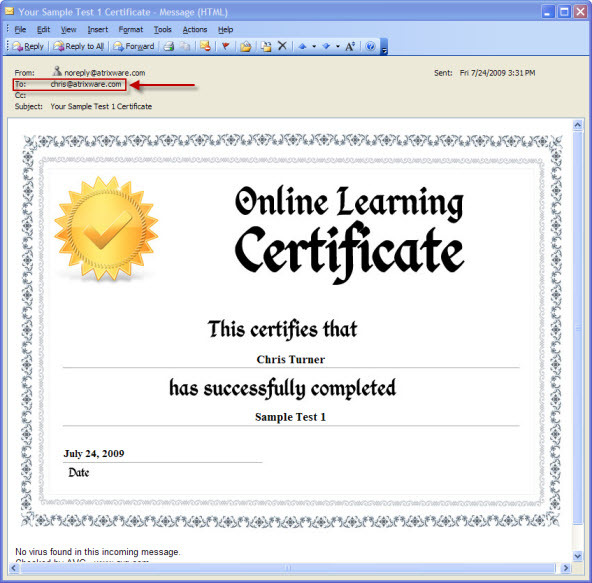 You and your students should be able to access the quiz by going to http://yoursite.com/folder – with yoursite.com being the URL to your web server and folder as the name of the folder that you created and uploaded your files to in the last step. 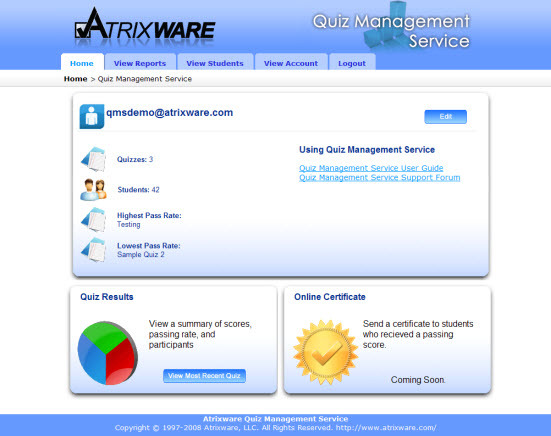 Atrixware Quiz Management Service is an easy online solution for emailing, exporting, viewing, and storing online quiz results published from our Quiz Publishing Software. This article is going to show you how to publish a quiz using Atrixware Test Pro Developer that utilizes the Quiz Management Service. To begin, I’m going to start Test Pro Developer and from the Develop tab I am going to select to create a New Test/Module. This will bring up the Create New Test / Module window, where I can select the template that I would like to use for my test. 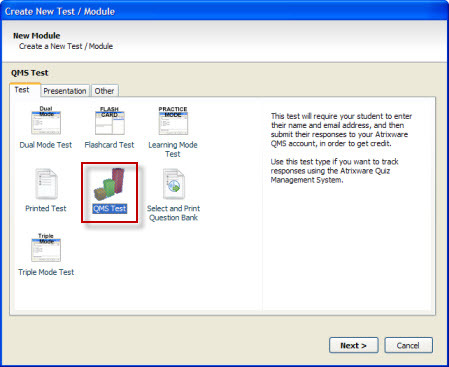 To use the Quiz Management Service, I want to select the QMS Test template from the Test tab and click the Next button. I will now be prompted to enter a title for my quiz and optionally a summary. 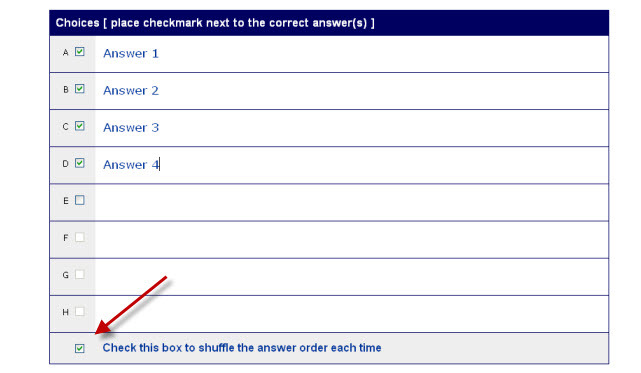 Once I have entered my quiz title, I’ll click on the Finish button to create my QMS Test. Clicking on the Finish button will bring up a dialog window asking me to enter my email address. If I already have a Quiz Management Service account, I want to enter the email address I use to login to my account. If I haven’t yet used the Quiz Management Service, I can simply enter my email address and my account will be created for me the first time a student completes my quiz. If I wanted to, I can edit the appearance of the page. I can do this by going to the Develop tab, highlighting the test I created, and clicking on the Files & Resources tab from the top bar. One of the files under the Files & Resource tab should have the filename qms_submit.txt. By opening and editing this file, I can change not only the appearance of the page, but what information is collected from the student and submitted to the Quiz Management Service. Here you can easily change the appearance of the form the student sees without actually changing the form itself. For example, if you wanted to change the size of the font of the word IMPORTANT: , you could change font-size: 10pt; to font-size: 14pt; under .style2. Or if you wanted to change the color of the text from black to green you could add color: #00FF00; inside of .style1. Here you can easily change the appearance of the report that is included in the email sent to you when a student completes the test, as well as is stored in the Quiz Management Service. By editing the CSS here, you can change the font type, color, size, and weight for the report headings, question text, answer text, result text, correct answer text, and the explanation text (in that order top-bottom). In this section of the file you can customize the report that is being sent to you via email and being stored by the Quiz Management Service. Not only can you change the layout of the report, but you can also add additional information to your report gathered from PowerScript. You could easily add values for things such as <% Score.GetPassingScore %> or <% Score.GetRoundedValue %> to add the passing score for the test and students rounded score. Using values you set via PowerScript, you could pass information about class, subject, category, test version, or almost anything else you could imagine. Another powerful option for customization that Test Pro Developer gives me is the ability to configure whether or not the student sees the report I set up in the section above or if they see a custom message upon completion of the test. To edit this option or customize the message displayed to the student, I’ll need to go in a edit the PowerScript for my test. 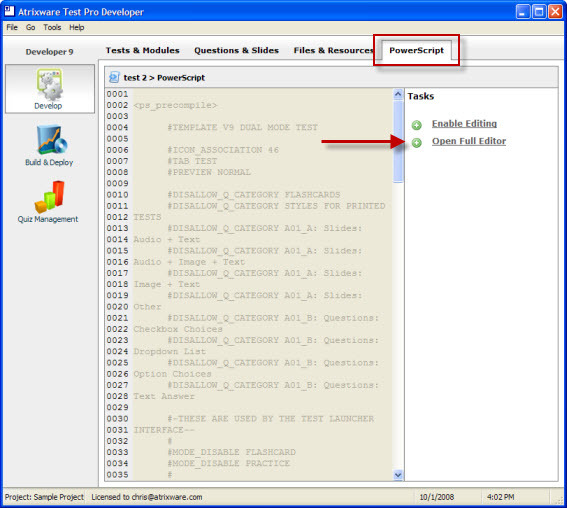 With the QMS Test I created still highlight, I want to select the PowerScript tab from the top menu and then click on the Open Full Editor link in the Task Panel. In the PowerScript Code Editor I want to use the scrollbar on the right hand side to scroll down until I see the section of code entitled QMS Values. There are three values I can change by editing this section of code. The first is qms_account, which is the email address I entered when creating my QMS Test where I wanted the results to be sent. The second value I can edit is show_results. If show_results is set to true, then upon completing the test, my students will see the full report I set up after they have submitted their test score. If show_results is set to false, the student will instead see the message stored in the last value I can edit, the response value. The response value is the message displayed to the student upon completing their quiz instead of the full report. 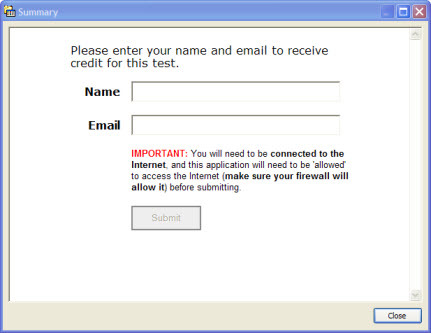 By default it is a generic message, but using HTML I can customize the message to match the rest of my test. Your Results have been submitted. Click CLOSE to finish. 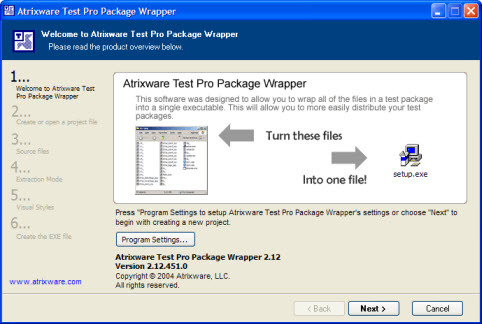 As you can see, Test Pro Developer offers a nearly unlimited amount of customizations when it comes to the results that it uses along with the Quiz Management Service. After I have distributed my test and a student has completed it, I can click on the Quiz Management tab and login to the Quiz Management Service using the email address I chose to have my results sent to. By default, the username and password for the Quiz Management Service is the email address I entered when publishing my quiz. 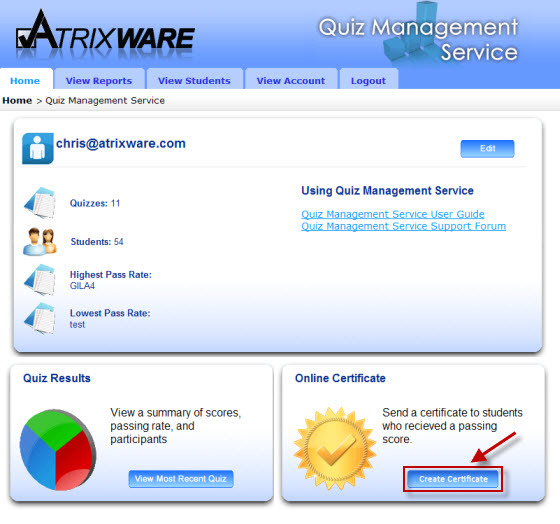 Atrixware Quiz Management Service is an easy online solution for emailing, exporting, viewing, and storing online quiz results published from our Quiz Publishing Software. 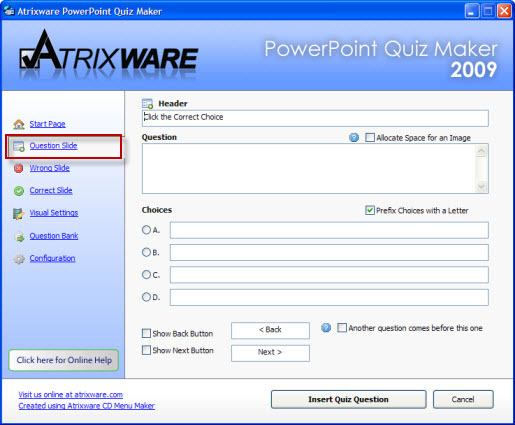 This article is going to show you how to publish a quiz using Atrixware Flash Quiz Maker that utilizes the Quiz Management Service. 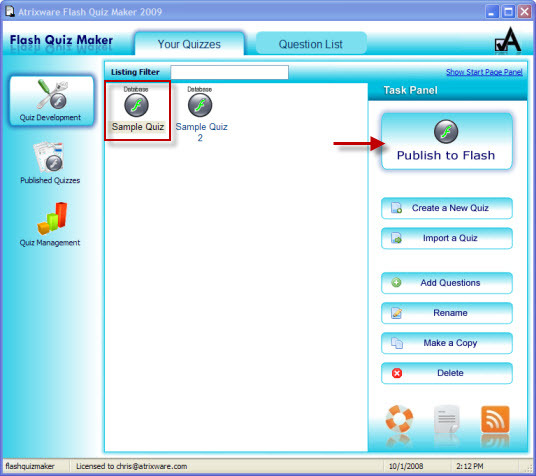 To begin, I’m going to start Flash Quiz Maker and from the Quiz Development tab select the quiz I would like to publish to the Web. 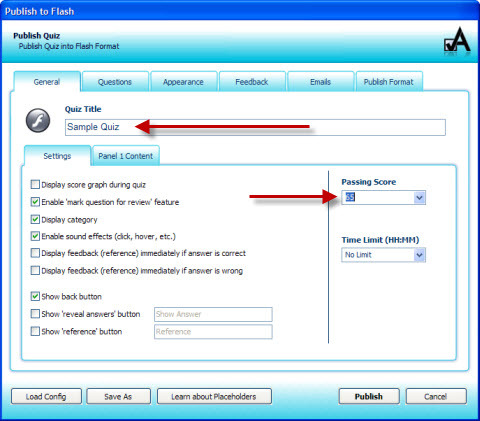 With my quiz selected, I’m going to click the Publish to Flash button in the Task Panel. This will open the Publish to Flash window. The first tab I am brought to is the General tab, where you can enter a title for the quiz, configure what is displayed to the student, set the passing score, or set a time limit. For this tutorial, the only thing I am going to change in the Passing Score, by selecting the drop-down box and setting the score to 65. The next tab I want to work with is the Emails tab, where I can configure the layout and content of the results that are going to be emailed to me and stored in the Quiz Management Service. When I click on the Emails tab, I am presented with two additional tabs, the PASS Email tab and the FAIL Email tab. The PASS Email tab are the results that sent if the student passes the quiz, while the FAIL Email tab are the results sent if the student fails the quiz. I can edit my results to display the information that I find relevant to me. By default, the result email for the PASS Email tab displays a category report (a score per category breakdown) and the questions missed. Using placeholders, it is possible to show the quiz date, title, a report of all questions, and more. To see what placeholders are available and what they do, click the Learn About Placeholders button. Working in the PASS Email tab, I can edit the format of the results by using the text-editor buttons located on the bottom. I can set some text as a hyperlink by selecting the text and entering a hyperlink in the field below the Font Style selection. 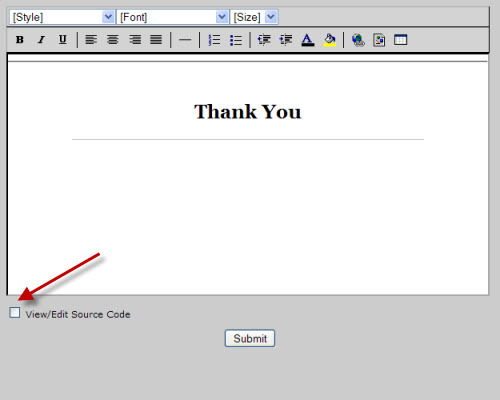 There are also two buttons on the right hand side, which allow you to edit the HTML source and Check Spelling. Once I’ve finished setting up my reports, I’m going to move over to the Publish Format tab. The two options that will allow my quiz to access the Quiz Management Service is the Any Web Server option under the Web Server tab and the CD-Rom / Executable option under the CD or Local tab. 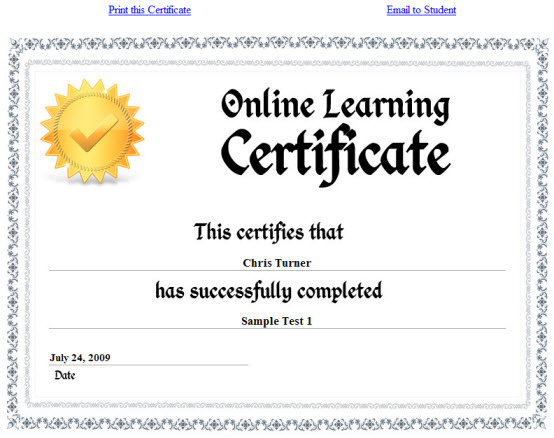 To publish my quiz so that students can take it online via a URL link, I would choose the Any Web Server option. To publish my quiz so that I can distribute it via CD-Rom, download, or email attachment, I would select the CD-Rom / Executable option. After I’ve chosen how I would like to publish my quiz, I’m going to check the Email Results to box at the bottom and enter my email address. I’m also going to check both boxes for Ask for user’s name and Ask for user’s email address so that they will both be entered into the Quiz Management Service. NOTE: If you choose to not ask a student for their email address, their email will appear in the Quiz Management Service as the student’s name at their ip address. (i.e. student@127.0.0.1). You can then edit the students email from within the Quiz Management Service. I’ll click the Publish button and be taken to the Published Quizzes tab with the quiz I just created. Once a student has completed my quiz, I can click on the Quiz Management tab and login to the Quiz Management Service using the email address I chose to have my results sent to. By default, the username and password for the Quiz Management Service is the email address I entered when publishing my quiz. 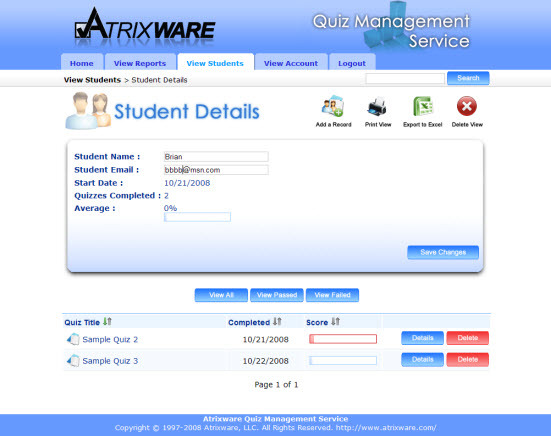 Atrixware Quiz Management Service is an easy online solution for emailing, exporting, viewing, and storing online quiz results published from our Quiz Publishing Software. 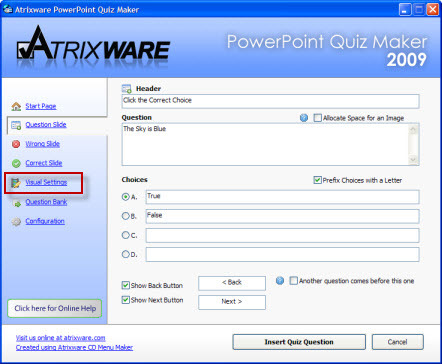 This article is going to show you how to publish a quiz using Atrixware Online Quiz Maker that utilizes the Quiz Management Service. 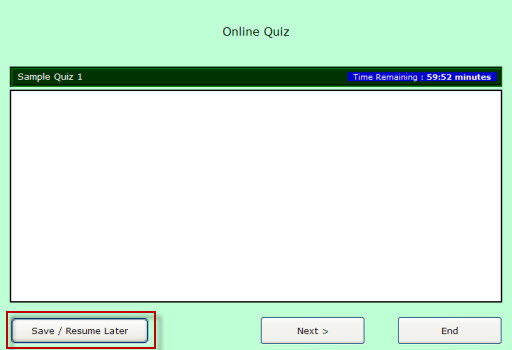 To begin, I’m going to start Online Quiz Maker and from the Quiz Development tab I’m going to Create a New Quiz. This will open the Create New Quiz window where I’m going to select to create a HTML Quiz. After I’ve click on HTML Quiz, I prompted to an enter a name for my quiz and optionally a summary. Once I’ve entered my quiz name, I’m going to click the Finish button, which will close out the window and bring me back to the Quiz Development tab. 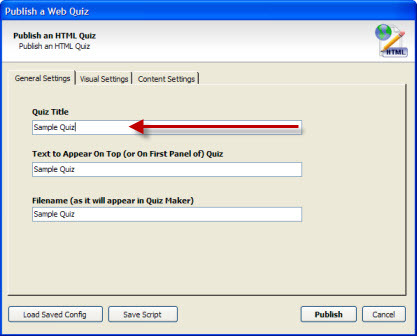 With my quiz selected, I’m going to click on publish to HTML Quiz from the Task Panel. This will open the Publish a Quiz window. The first thing I need to do is enter a title for my quiz, and optionally I can change the text I would like to have appear at the top of my quiz and the filename that Online Quiz Maker refers to this quiz by. For this example, I’m going to leave the Visual and Content settings as is, so after I have entered my quiz title I’m going to click the Publish button. I’m now presented with the option of having my score results emailed to me. In order to use the Quiz Management Service, I need to have the results emailed to me (once your Quiz Management Service account is active, you can choose to disable email reports and instead view the results online). 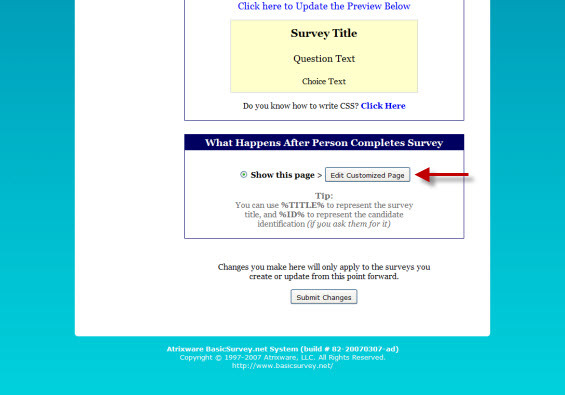 I’m going to click on Yes, I Want the Score Results Emailed Here: and enter my email address in the box below. I also have the option of asking for certain information from the student when the quiz begins (Email Address, Class Name, Instructor, etc). 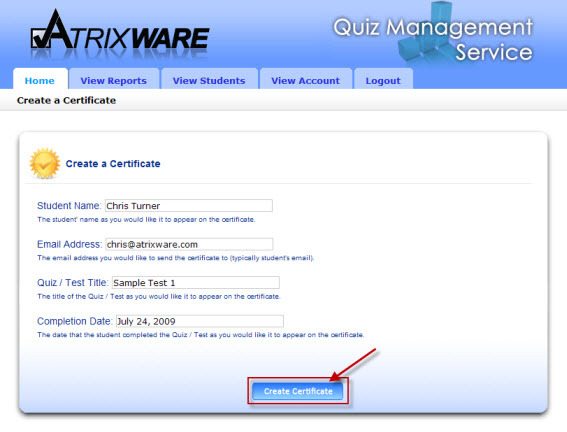 It is important to note that only the Student Name and Student Email are stored by the Quiz Management Service. If I select any of the other options, they will be visible in the email that is sent to me when a student completes my quiz, but they will not be available within the Quiz Management Service. I can also configure what the student sees upon completing my quiz. From the Upon Completion, Show.. drop-down box I can select to display a Complete Summary (which would include all the questions, answers, and explanations), Their Score, or simply a Thank You Message. I’ll click the Ok button and be presented with a confirmation that my quiz has been published and I can view the published quiz now. Once a student has completed my quiz, I can click on the Quiz Management tab and login to the Quiz Management Service using the email address I chose to have my results sent to. By default, the username and password for the Quiz Management Service is the email address I entered when publishing my quiz. NOTE: It is not currently possible to change the Passing Score for your quiz using Online Quiz Maker. Therefore, by default, any quizzes utilizing the Quiz Management Service will have the passing score for that quiz set to 70 within the Quiz Management Service – this will not affect your quiz itself, but may affect some reporting from within the Quiz Management Service. How do I create a Quiz for the web using Flash Quiz Maker? 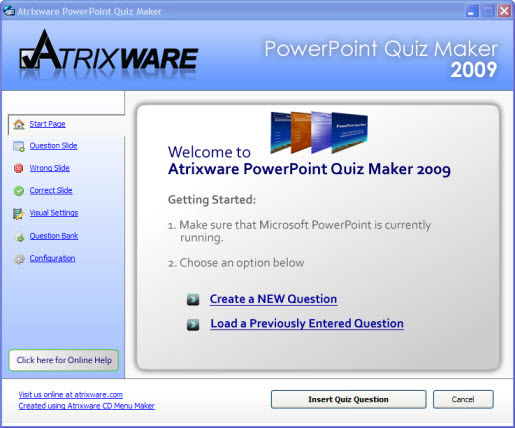 Atrixware Flash Quiz Maker 2009 is a powerful tool for making online quizzes quickly and easily. 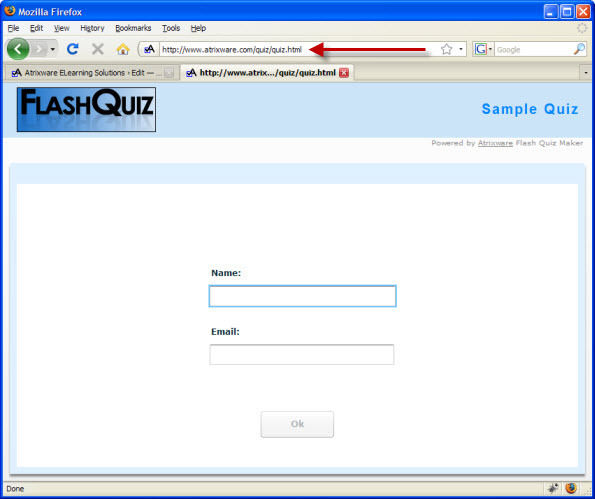 With Flash Quiz Maker you publish quizzes to be used on your Basic HTML website, your ASP website, or your PHP website. In this tutorial I’m going to show you how easy it is to publish any one of these quizzes for you to place on your exisiting website. To begin, we want to start on the Quiz Development screen where we will highlight one of our quizzes. 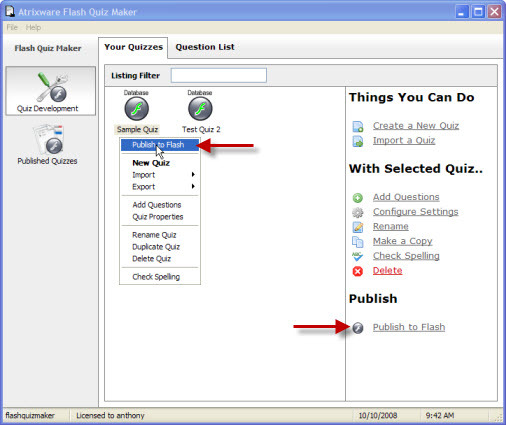 To publish the Quiz, we can either right click on the icon for our quiz and select Publish for Flash from the menu or you can click Publish to Flash from the Task Panel on the right hand side. This will bring up the Publish to Flash screen. The Publish to Flash area is loaded with options wher you can configure the functionality, look, and feel of your Quiz, but for the purposes of this article we’re going to leave everything as is and just focus on the portion of the Publish Format tab that pertains to web Quizzes. Click the tab that reads Publish Format all the way on the right hand side. 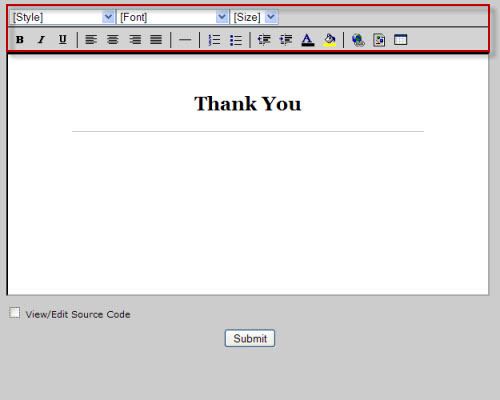 On the Publish Format screen you’ll see two more tabs appear, the Web Server tab and the Local or CD-Rom tab. If you wanted to publish a Quiz that you could use locally on your hard drive or network or publish a Quiz you could distribute via CD-Rom / Standalone download, you would work in the Local or CD-Rom tab. Since we want to publish to the web, we’re going to work in the Web Server tab. 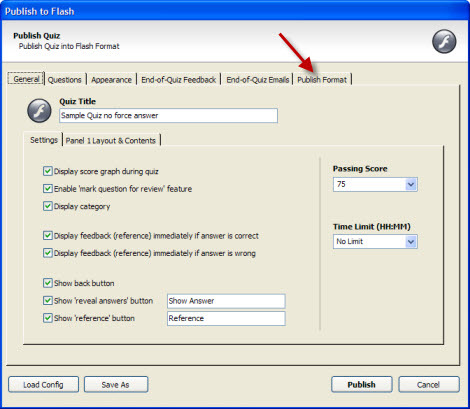 Flash Quiz Maker gives you three different options for publishing Quizzes to a Web Server, Basic Server (HTML), PHP Server, and ASP Server. 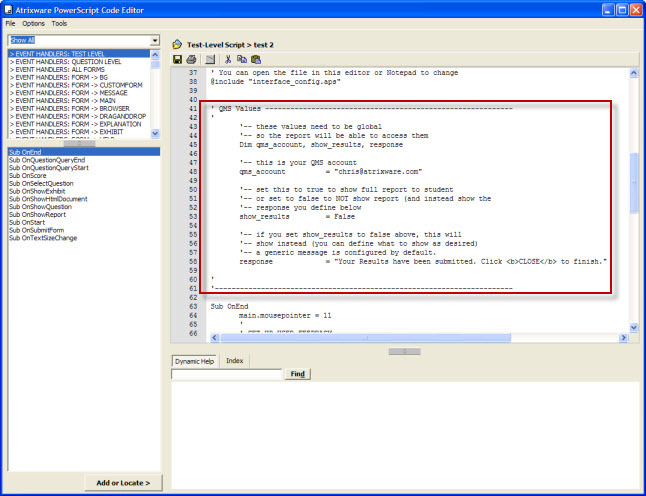 Basic Server: Using the Basic Server option publishes the Flash Quiz to be used as an HTML file. 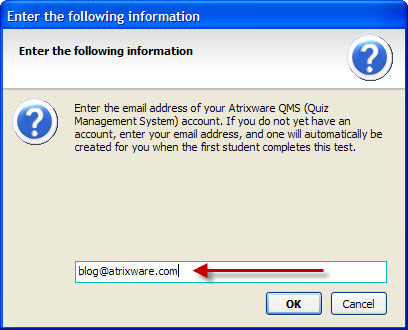 Note that with this option, if you select to have the results of the Quiz emailed to you the Quiz will use the atrixware.com server to send the email report, which may incur a nominal fee. 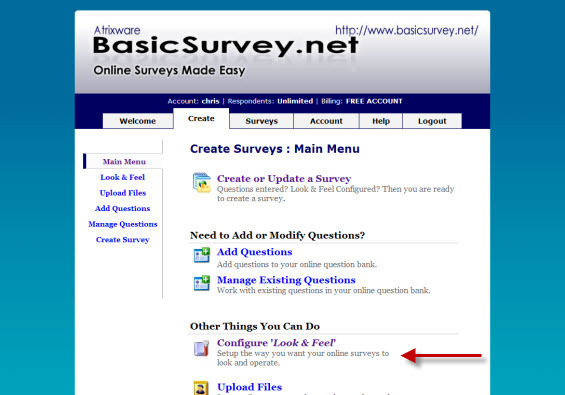 To get students to this quiz you simply need to give them the URL of the Quiz on your webserver. For example if the name of your server was www.example.com and you uploaded the quiz to a folder named samplequiz, then the address you would give for this Quiz would be http://www.example.com/samplequiz/quiz.html. PHP Server: Using the PHP Server option publishes the Flash Quiz to be used on your PHP enabled server (typically linux/unix based servers). Note that with both the PHP Server and ASP Server options, if you select to have the results on the Quiz emailed to you it the Quiz will use your servers to generate the email report, meaning you do not have to worry about incurring any additional fees. 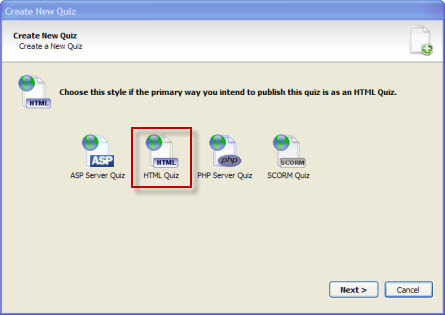 To get students to this quiz you simply need to give them the URL of the Quiz on your webserver. 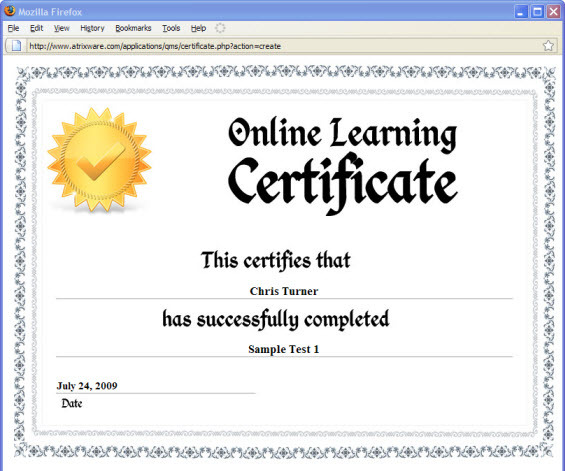 For example if the name of your server was www.example.com and you uploaded the quiz to a folder named samplequiz, then the address you would give for this Quiz would be http://www.example.com/samplequiz/quiz.php. 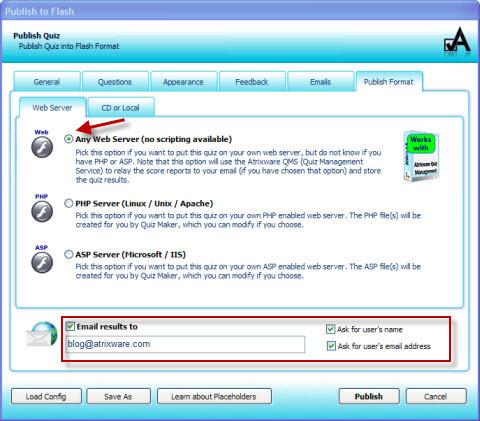 ASP Server: Using the ASP Server option publishes the Flash Quiz to be used on your ASP enabled server (typically Microsoft / IIS based servers). A nice feature of both the ASP Server and PHP Server Quizzes is that if you yourself or someone you know has any knowledge of either the ASP or PHP programming language, the generated script can be modified to add results to a database, track internet users that have taken the Quiz, and much much more. Once you have selected the type of Web Server quiz you would like to create and you click the Publish button in the bottom-right corner of the screen, Flash Quiz Maker will automatically generate the Quiz and files you need to place on your server. 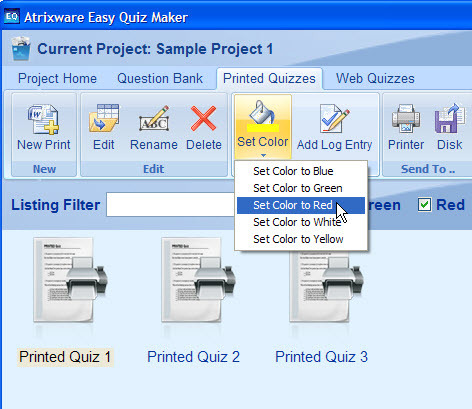 Once the quiz has been published, a screen will appear featuring the quiz that you just created, along with a window with some instructions on how to get the Quiz online. 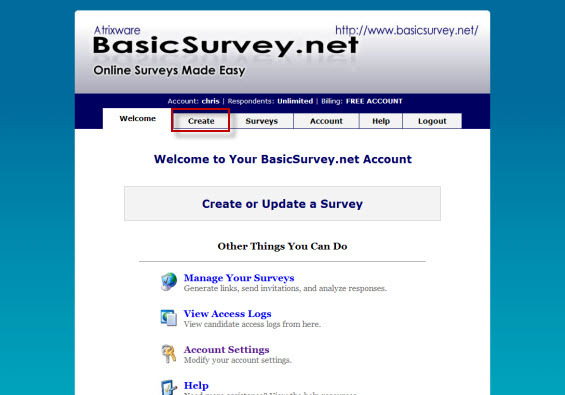 The section that is most important here is the How to Get This Quiz On To Your Web Server section. For all three types of web server quizzes the results here are basically the same. The first step is, using either your hosting control panel, a program like Dreamweaver, or an FTP program, create a new folder on your webserver where you would like to hold the quiz. 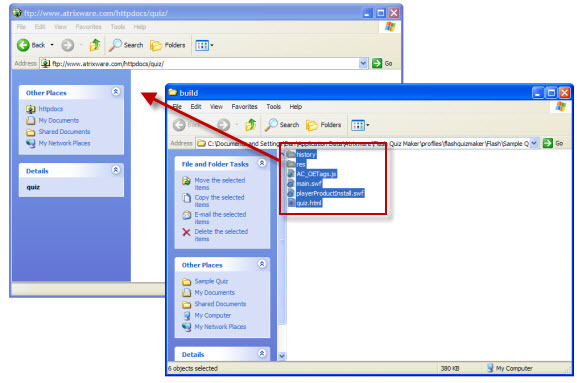 The second step is to either click the View Files to Distibute link that appears right in the instructions or to click the View Files to Distribute option in the Task Panel on the right hand side. 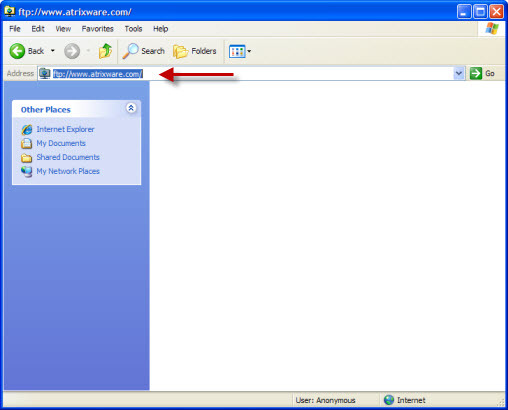 This is will open up a Windows Explorer folder containing all the files that you want to upload to your Web Server. The final step is to, again using your hosting control panel, a program such as Dreamweaver, or (most likely) a FTP program, upload all the files and subfolders that you see in the Windows Explorer folder to the folder you created on your Web Server in the first step. 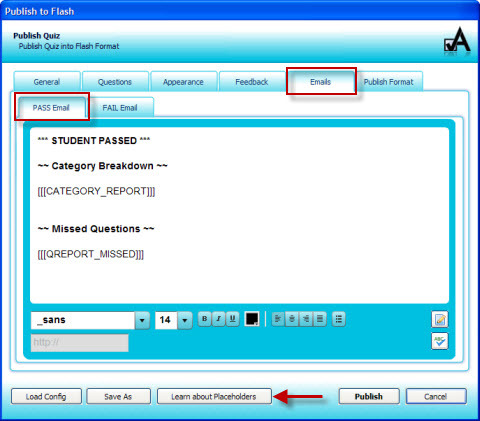 Now that you’ve place your quiz files online, you simply need to direct the students to the URL of the Quiz using the instructions I mentioned earlier in the tutorial or by following the instructions entitled How to Get Your Students to The Quiz that are displayed when you select any of your Publishes Quizzes from within Flash Quiz Maker. 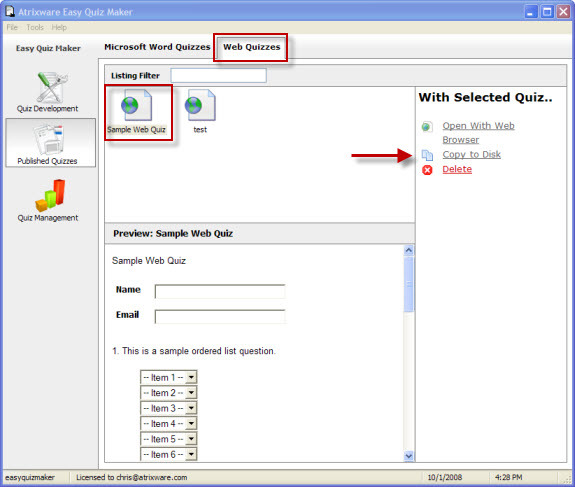 When creating Quizzes using PowerPoint Quiz Maker 2009, there are of a number of Visual Settings that can be utilized to make your Quiz slide integrate seamlessly with the rest of your PowerPoint presentation. In this tutorial I’ll be going over what these Visual Settings are and how to use them effectively. To begin, I need to make sure I have Microsoft PowerPoint running along with PowerPoint Quiz Maker. In Microsoft PowerPoint, Ishould have a presentation open with the slide currently selected where I want to insert my Question slides. In PowerPoint Quiz Maker, I should have a Question (complete with the Wrong/Correct Slides) ready to be inserted into my presentation (or I could always pull Questions from my Question Bank). This will bring up the Visual Settings screen. 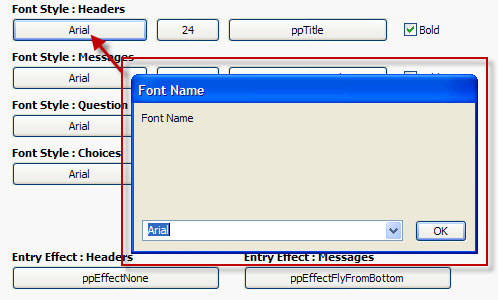 The first options that are presented to me is the font styling for the Headers, Messages, Question, and Choices. The Headers are the text I chose to be displayed along the top of the Question, Correct, and Wrong slides. The Messages are the text I chose to be displayed as a message to the user on the the Correct and Wrong slide. Finally, the Question and Choices are the Question and Answers themselves that appear on the Question slide. The first button in each Font Style, allows me to select the font face I would like to use for each style. Clicking on the button (which by default is set to use the Arial font) will bring up a window with a drop-down box where I can select from a number of popular fonts. The second button corresponds to the size of the font that I want to use for each style. Again, clicking the button (which by default is set to size 24 for the Headers and size 14 for the remaining styles) will present me with a window where I can select a font size. The next button allows me to set which color settings from my PowerPoint presentation that I want the style to inherit. 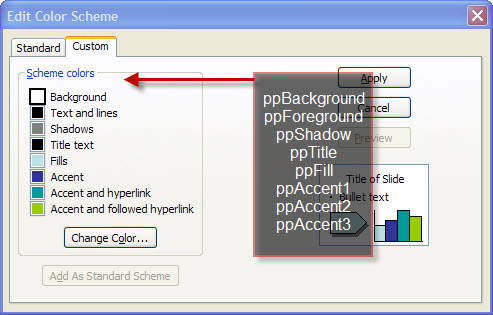 By clicking this button I am presented with a window and a drop-down where I can select ppBackground, ppForeground, ppShadow, ppTitle, ppFill, ppAccent1, ppAccent2, ppAccent3. This brings up the Edit Color Scheme window, where I can edit the presentation’s color scheme, as well as see how they match up with the options presented in the Visual Settings tab of PowerPoint Quiz Maker. Heading back into PowerPoint Quiz Maker, the last option presented to me for styling the fonts is whether or not I want the text to be bolded. By checking the box to left of the word Bold, I can decide whether or not I want that font to be styled bold or not. On the bottom half of the Visual Settings screen, I am given the option to select which kind of Entry Effects, if any, I would like to use for my four different types of text (again the same text we can style the fonts for: Headers, Messages, Question, and Choices). 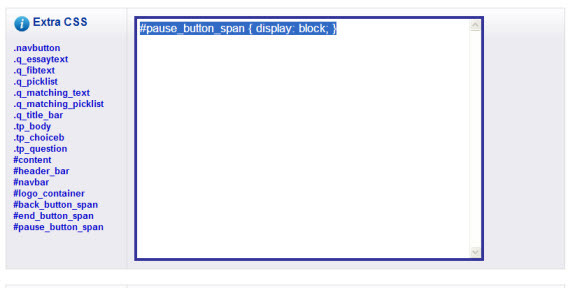 If I was to click any of these buttons, a window would popup and I would be presented with a drop-down box where I could select the type of Entry Effect I would like to use. There are far too many Entry Effects to go into, suffice to say each effect available to in PowerPoint Quiz Maker is the same effect you would see in Microsoft PowerPoint. Once I’ve completed selecting all my Visual Settings, I can simply add Questions to my PowerPoint slide by clicking the Insert Quiz Question button or loading them in via the Question Bank.